Rotork GO gas-over-oil actuators have been supplied for vital failsafe valve control duties on a new cryogenic LNG pipeline in Venezuela. In addition to providing the best technical solution for the application, the actuators were selected because of the high level of local support available from Rotork’s well-established company in Venezuela. The San Joaquin Pipeline, owned by Venezuela state oil company PDVSA, transports LNG for the international market between the San Joaquin and Jose cryogenic plants. The Rotork actuators operate 26 inch, 20 inch and 12 inch ball valves installed in tandem with non-return check valves at six valve stations along the route. The compact and modular Rotork GO actuator design uses the pipeline gas as the motive power source, converting the gas into hydraulic pressure to deliver powerful and smooth valve control. Isolating the actuator cylinder from the pipeline gas eliminates potential contamination, corrosion and seal deterioration, extending the life of the actuator. A dedicated pump is utilised in each operating direction to prevent leaking or contamination between the gas-over-oil tanks. At the centre of the gas-over-oil system, a multi-function manifold block integrates gas control functions to facilitate a full range of selectable failsafe and emergency shutdown (ESD) options for pipeline events including Line Break, Low Pressure Close and High Differential Inhibit. The manifold has the facility for a high-flow hand pump, pressure relief and a locking handle for safe commissioning. Rotork GO actuators are IP66M/67M third party certified and approved for environmental protection, together with CE and ATEX hazardous area certification. The standard working operating pressure range is 10 to 105 barg, enabling a quarter-turn operating torque of up to 600,000 Nm and linear thrust of 5,000,000 N to suit pipeline valves of virtually all sizes and description. Higher torque and thrust outputs can also be provided for. Rotork Controls de Venezuela has fully trained technicians available to provide field services for all ranges of Rotork’s electric and fluid power actuators; the company supports the PDVSA Puerto La Cruz Refinery on a service contract basis. 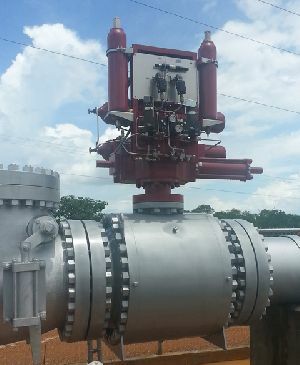 Find out more about GO range pipeline actuators.